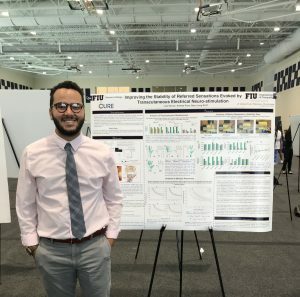 Congratulations to undergraduate BME student Luis Herran for winning the 2019 Conference for Undergraduate Research at FIU (CURFIU)! He presented his research titled “Improving the Stability of Referred Sensations Evoked by Transcutaneous Electrical Neuro-stimulation”. His research is about loss of sensory function due to disease or limb amputation can be a devastating, life-changing event. Implantable neural stimulators have shown potential for providing naturalistic referred sensations, however, they require invasive surgical procedures. This study investigates the potential benefits of using interfering multichannel transcutaneous electrical stimulation through surface electrodes to evoke more stable and consistent distally referred sensations than traditional single-channel stimulation. The CURFIU 2019 award certificate will be awarded at the 2019 Phi Kappa Phi (PKP) Induction Ceremony. The induction ceremony will be on April 20th.